This 49-piece rubber assortment kit includes most of the commonly-used and replaced rubber rings and bumpers for use on most makes and models of games. 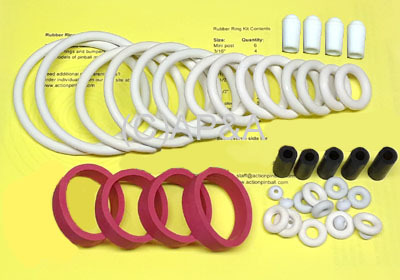 Includes white round rings from mini-post bumper rings all the way up to 3-inch rings, black/yellow post sleeves, red flipper rings, and ball shooter tips. Extra handy for spare parts and backup replacements! Looking for a kit for a specific game? Use the Search feature at top of page to search by game name.